I last posted my self-portrait on February 7. At that point, I could recognize myself in the painting, but wanted to let the project rest for a bit, so I didn't work on it for a week. During that time, I listened to reactions of people who know me. Some people thought it really looked like me, and some people said it was very close, but not quite. . . . After a lot of listening and looking, I concluded that my face is just a bit shorter and rounder than in the painting and this was throwing the facial proportions off a little, but enough to matter. It is frightening to change a portrait at this stage (even if I am the only client! ), so I decided to try the changes out digitally before I touched the actual canvas. 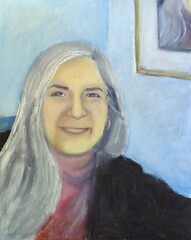 So I opened a photo of the portrait as of day 5 in Painter IX, and then drew the changes in with digital pastel. I shortened the nose by just a tiny bit, and also made it just a bit narrower. These changes allowed me to get the left-hand cheek muscle into the correct position. Then I put a touch of white into the corner of the left eye. With those few changes, the likeness immediately looked stronger to me. I decided to just change this much, and later deal with changes to the position of mouth and chin which would inevitably follow. On canvas, these are very small changes (less than a quarter of an inch), but still scary because you can lose the likeness in the process. But small changes are important in a portrait, and I am doing this to learn. Still, I was afraid to ruin what I already had. But I resolved to try. I printed out a copy of this image to use as a guide in the studio the next day when I made the same adjustments on the canvas. In art, as in life, small changes sometimes take courage. To be continued. . . .